Today the Plaintiffs in the lawsuit, Gingery et al. v. City of Glendale, BC556600, along with a new plaintiff, Masatoshi Naoki, filed an amended version of their original complaint, which was filed on September 3, 2014 with the Superior Court of the State of California, Los Angeles County. GAHT-US, one of the lawsuit’s plaintiffs, takes this opportunity to highlight certain aspects of the Amended Complaint, which above all strenuously demands that the City of Glendale removes the Comfort Women statue and its attached plaque. The original complaint described the lack of City Council approval for the wording of the plaque, which GAHT-US finds offensive and one-sided. In the Amended Complaint, we add causes of action related to Glendale’s violation of the equal protection clause and privileges and immunities clauses of the California Constitution. Plaintiffs contend Glendale has deprived the Plaintiffs, and all its Japanese American citizens, of the equal protection of the laws and has offered them certain privileges and immunities on different terms than non-Japanese by installing the Comfort Women statue and plaque on city property, an action which we allege was due to coercion from a private group that had been formed specifically to erect anti-Japanese monuments in the U.S. Plaintiffs contend that the Glendale monument unfairly accuses Americans of Japanese origin and descent of war crimes and “unconscionable violations of human rights.” In fact, scholars, elected officials, journalists and the general public around the world vigorously question and debate the nature and extent that the Japanese Imperial Military was involved with coercion and enslavement of women. GAHT-US deplores violence and injuries against the innocent wherever and whenever it occurs, but such accusations must not be made lightly. As a result, GAHT-US contends that the City of Glendale has deprived its Japanese-American citizens of equal treatment under the law by interfering with their use and enjoyment of public facilities and public benefits. Specifically, plaintiffs Mrs. Gingery and Mr. Naoki are senior citizens and Japanese-American citizens who are unable to benefit on equal terms from the services offered to other senior citizens and Glendale residents. As Plaintiffs explain in detail in their court filings, Glendale erected the Comfort Woman statue on public property that was reserved for all of Glendale’s sister cities in Japan, Armenia, Mexico and South Korea. Glendale presented the statue as a “Peace Monument” to honor sister cities. But instead of honoring all of its sister cities, Glendale mistakenly presented an unfair view of Japan and Japanese people by adopting a Comfort Women statue that presents a biased and anti-Japanese view of historical, political, and diplomatic issues between and among Japan, South Korea, and the United States. The GAHT-US Corporation seeks peaceful and diplomatic resolutions of these issues, and does not wish to cause any international conflict. Rather, GAHT-US seeks friendly and honest relations among countries. We believe that such relations can be established only after the historical events are understood based on facts rather than fabrication, rumor, or political compromise. It is regrettable that litigation has become necessary to address these sensitive issues, but this lawsuit is a part of our overall activities intended to improve everyone’s understanding of our history. 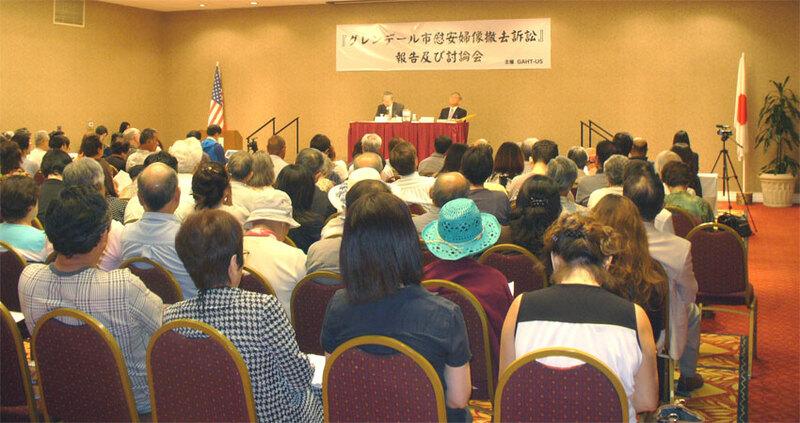 GAHT-US seeks to engage in a balanced discussion that protects equal rights and equal treatment for Japanese-American citizens of Glendale, and for all people. On this day, our attorney took two separate legal actions. First, notice was filed that we will be appealing the U.S. District Court’s August 4 decision to the U.S. Court of Appeals for the Ninth Circuit Court. And second, a separate lawsuit was filed in the Superior Court of California in Los Angeles. These actions are continuation of the lawsuit, Michiko Gingery et al v. the City of Glendale, which was filed in the U.S. District Court for the Central District of California on February 20, 2014. The decision in this case announced by U.S. District Judge Percy Anderson on August 4, 2014 was, in our view, inappropriate. Thus, we have decided to appeal the first cause of action of the Gingery lawsuit, infringement by the City of Glendale upon the Federal Government’s exclusive power to conduct the foreign affairs of the United States, to the U.S. Court of Appeals for the Ninth Circuit Court. Further, we have filed a new lawsuit, corresponding to the second cause of action of the Gingery lawsuit, alleging administrative negligence by the City Council and the City Manager for not voting on the proposed text to be engraved on the plaque next to the Glendale Comfort Women statue. The new lawsuit is permitted according to Judge Anderson’s August 4 decision, which directed the matter to the state court. 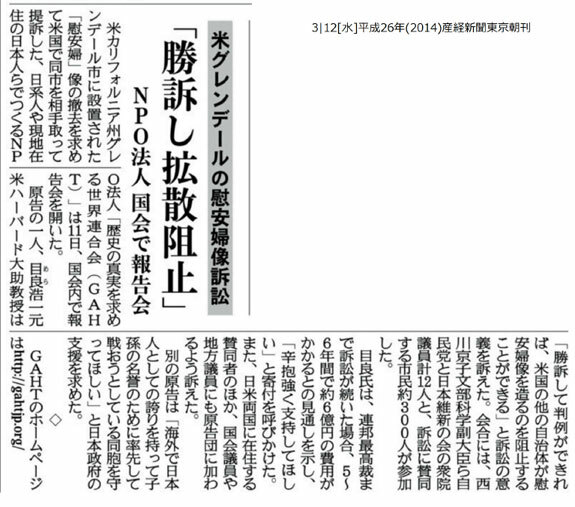 GAHT does not seek to interfere with the international relations of Japan with the United States or any other country. To the contrary, GAHT is eager to improve them through a balanced examination of the issue of wartime prostitution and of Japan’s experience in redressing its past in this regard. GAHT deplores this issue being used to create a negative image of Japan, Japanese citizens, and Japanese Americans in order to weaken the US-Japan strategic partnership that has flourished for over 60 years and has been the backbone of the U.S. policy in East Asia. We are looking forward to continuing support for these lawsuits by many observers in the United States, Japan and elsewhere.